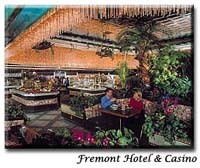 Fremont Hotel & Casino is located five miles from McCarran International Airport in downtown Las Vegas, right on Fremont street. 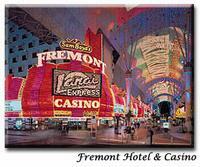 The immediate area offers many attractions – gaming, dining, and the bright lights of the Fremont Street Experience. It is just a short drive to the fabulous Las Vegas Strip, so this hotel provides an ideal base for all visitors to Las Vegas, whether business or fun. 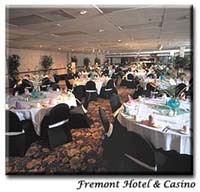 The hotel is a symbol of what visitors love most about Las Vegas. The excitement, the hospitality, and the allure of the lights and gaming tables, have been a trademark of the hotel for more than 40 years. 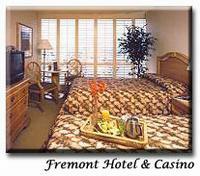 Guestrooms feature cable televisions and two double beds or one king bed. All 447 accomodations feature tan carpeting, muted walls, large windows, tables and chairs.